QUITO, Ecuador — The director of a foundation that works in Ecuador’s rainforest says Amazon tribesmen apparently carried out a revenge attack and killed an undetermined number of people from a rival indigenous group that lives in voluntary isolation. Foundation director Milagros Aguirre says Huaorani war party attacked a settlement of Taromenane, likely over the weekend. She says an unknown number of people were killed and at least two children were carried off in retaliation for the March 5 spearing deaths of a Huaorani couple. It is common for the region’s tribes to kidnap foes’ offspring as war trophies. An Ecuadorean Justice Ministry official said Wednesday the Huaorani involved had refused to receive a government delegation trying to investigate the attack in the Pompeya region, about 120 miles east of Quito. File picture shows an Huaorani tribal instructor teaching jungle survival techniques to troops, in the Amazonian province of Orellana, Ecuador. Amazon tribesmen killed at least 18 people in an apparent revenge attack against a rival group in Ecuador, an indigenous leader said Thursday. AFP – Amazon tribesmen killed at least 18 people in an apparent revenge attack against a rival group in Ecuador, an indigenous leader said. Citing a person who participated in the attack, Gilberto Nenquimo told AFP that elderly men and women were among the dead, along with an unknown number of children. He was speaking from the southeastern town of Puyo. According to Huaorani leaders, several members of the clan attacked a settlement of the Taromenane clan over the weekend in retaliation for the March 5 spearing deaths of a Huaorani leader and his wife. On Wednesday, Huaorani of Ecuador president Cahuetipe Yeti said the attackers also took two Taromenane girls to a Huaorani community. Nenquimo, vice president of Yeti’s group, said that Huaorani leaders had negotiated with the attackers so that the two girls — aged between eight and nine years old — would be returned to their clan to avoid further reprisals. This type of attack is common among tribes in the vicinity of Yasuni National Park. 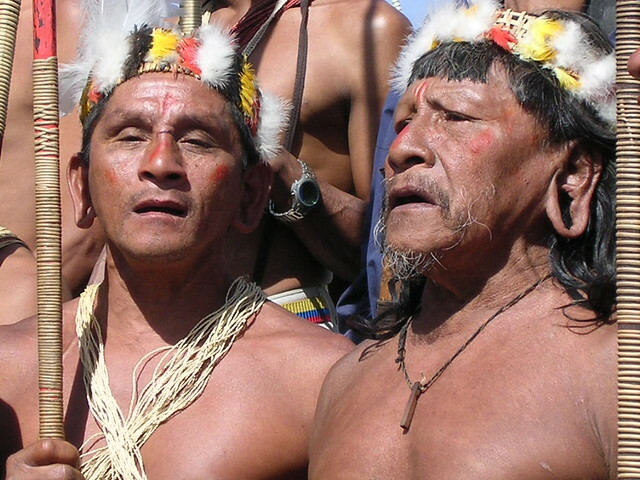 A 2003 raid allegedly conducted by the Huaorani against a Taromenane settlement left 23 women and children dead. There are no official figures on the two tribes, but Nenquimo estimated they number about 200 members together. ~ by FSVSF Admin on 12 April, 2013.